If you love wearing sarees, then Mermaid style would need an introduction. The most voguish of saree styles, Mermaid style is a perfect confluence of traditional draping with the modern take. Mermaid style, as the name suggests, will create the final look identical to a mermaid taking help of the saree pleats. Mermaid style particularly became famous when Bollywood celebrities started to flaunt it. Soon it reached to the daily soaps from the Bollywood movies and became a rage. This style of saree is extremely comfortable to wear. This style embodies the spirit of Indian women perfectly and reflects the spirit she harbours. If you love to experiment, then this saree style is definitely for you. Mermaid style draping differs from other sarees because of the way it is draped and pleated. Unlike other sarees, Mermaid style does not have any pleats in the front. In fact, it is draped in such a way that the front looks like a skirt. Mermaid style is the only saree style which is ideal for all body types. It is especially recommended for people who want to look slimmer and taller. If you tend to look healthy in a saree, then Mermaid style is the best option for you to look sleek. The figure-flattering style is best achieved with 9 yards of saree. It might be tight from some hip area and restrict movement but looks extremely modern and stylish. Always remember to take small steps while walking in mermaid style draped saree. You must be careful and make sure that you don’t take quick and long steps. This style needs tiny steps just like that of mermaids. To get more out of this draping style, choose a light coloured saree with an embellished or contrast blouse. It will bring out the beauty of the mermaid drape more. How to make mermaid style drape? Mermaid style drape is easy to make once you understand the steps completely. It is also popularly known as Fish style saree so no need to get confused as both are the same things. 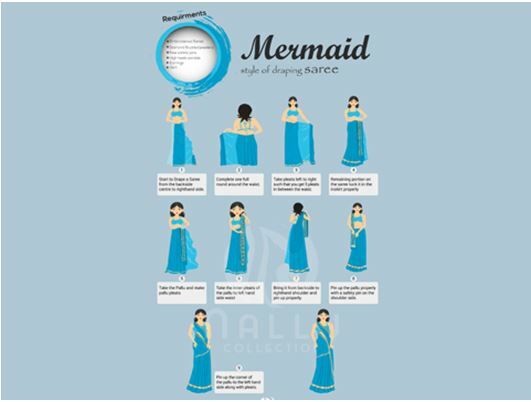 To start draping the saree mermaid style, you will require a few things. Make sure that everything is handy and nearby so that you can start the procedure of draping it. It is best to pick chiffon or georgette saree for the mermaid style as this style comes out best in these fabrics. Choose a light coloured saree with well-embellished border and pallu. In fact, a net saree with heavy work over pallu will also be a great choice. Start tucking the saree from your left as you usually do and bring it to the other side. Tuck the end of the saree onto the right side and at the same time tuck the pleats to the back or the side. Wrap it around and complete one round so that you come to the same place where you started. Make sure that the saree is falling around one inch over the ground. Start making pleats on the pallu and make sure that the length is long enough so it does not fall back. There are no pleats on the front of the saree in this style so we will only make pleats on the pallu and the front portion of saree will give the look of a skirt. Pallu pleats in mermaid style draping are made at the end or border of the saree. The border or shorter hem of the saree should be embellished as it will catch all the attention of this style making you the centre of attraction. While making pleats on the pallu, make sure that is falling around 4 inches from the ground. Make around 5-6 pleats minimum and keep securing them with safety pins along the way. If you have no idea about the pleats, you can roughly make them around a span width. This is the ideal width. The pallu should fall neatly on the side and pin it up to the blouse to be double sure that it doesn’t fall back and keep hanging from the shoulder.Also, clamping the pleats keep them secure from falling apart and makes it easy to handle the pallu. Now take the entire leftover saree and start draping it around. While you are at it, bring it to your right once again and ensure that you have pinned it properly with the petticoat. Also, make sure to tuck only the leftover part as much as it can while leaving a V around the hip area. Next, bring the end of pallu to the front while holding it from the corner of the inner pleat. Do it in such a way that it hides the V that was left and cover it. Now pull the pallu corner and bring it tightly on the front so that it gives a snug look. Secure it immediately with the safety pin. You will end up with a curvaceous, slim and chic silhouette in mermaid style which can be flaunted in any special occasion or Indian gathering.